Page Street Publishing, 9781624145872, 160pp. Discover the wonder of nature’s living colors and transform everyday items with The Natural Colors Cookbook, your guide to creating a spectrum of organic dyes using seasonal produce and leftover food. 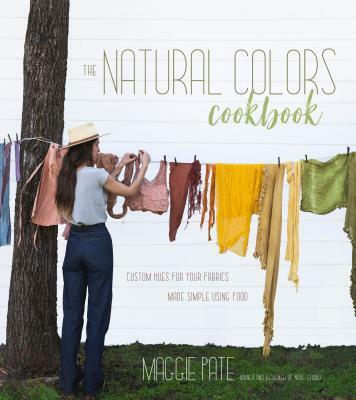 Now you can bring the timeless form of plant-based dyes to the comfort and familiarity of your own kitchen with the expertise of Maggie Pate, owner and designer of the naturally-dyed clothing label Nåde. Watch in awe as a few hours on the stove extracts a delicate blush tone from a handful of avocado pits, water-soaked black beans release an ashy blue hue and fennel feathers morph into an icy mint. Instead of tossing vegetable trimmings, transform red onion skins into an unexpected olive green, minimizing waste and avoiding harsh chemical dyes. From selecting among types of natural fibers to mordant and scouring baths, this introduction to hand dyeing covers everything beginners need to know to create a colorful custom palette of textiles. The Natural Colors Cookbook includes simple DIY projects for using your unique dyes, safety tips and precautions, advice for altering hues and instructions for collecting and cataloging colors. It’s an accessible and comprehensive resource every aspiring fiber artist needs. Maggie Pate began her career in fashion as a model but is now the owner and designer behind Nåde, an independent women’s clothing label featuring her hand-dyed fabrics based in Chattanooga, Tennessee. Maggie teaches sold-out workshops on natural hand-dyeing and weaving. She currently splits her time between Tennessee and New York City.